At this point, I think that I've proven how much of a love affair I am in with bold prints. The number of patterned kimonos and sundresses I have in my closet is both impressive and slightly worrying. This time around, I've decided to see how far I can push the pattern mixing line! 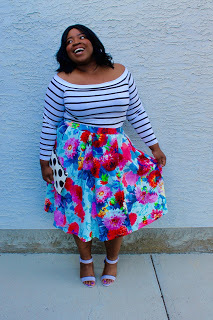 Stripes and floral print are both 2015 summer trends and I have seen so many variations of them being combined in one outfit. I decided to try the same while adding my own personal touches. Horizontal stripes always get a bad rap, but in this Asos Curve bardot top, the stripes are unbelievably flattering. Paired with this full midi skirt in a beautiful abstract floral print, it creates the perfect pattern combination. I added my own personal touch by pairing it with a third pattern, because if you're going to pattern mix, you might as well go all out. The polka dot clutch is a subtle enough print that really helps tie in the entire outfit. It picks up on the monotone palette of the bardot top while creating great contrast with the floral skirt. Minimal, neutral make-up and lavender sandals from New Look Fashion complete the entire look! Being plus size does not in any way mean that we can't wear bold, fun patterns. Horizontal stripes are for everyone, so if you feel so inclined to wear it, just do it! It's time to get rid of outdated plus size fashion rules and simply wear what we want, when we want.